For other people named Iamblichus, see Iamblichus (disambiguation). "Iamblichus Chalcidensis", "Iamblichus of Chalcis", "Iamblichus of Apamea"
Iamblichus, also known as Iamblichus Chalcidensis, or Iamblichus of Apamea (Greek: Ἰάμβλιχος, probably from Syriac or Aramaic ya-mlku, "He is king"; c. 245 – c. 325 AD), was a Syrian Neoplatonist philosopher who determined the direction taken by later Neoplatonic philosophy. 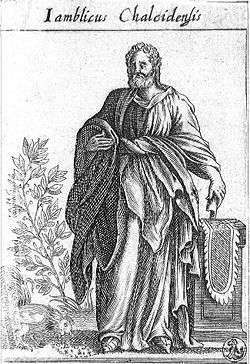 Iamblichus was the chief representative of Syrian Neoplatonism, though his influence spread over much of the ancient world. The events of his life and his religious beliefs are not entirely known, but the main tenets of his beliefs can be worked out from his extant writings. According to the Suda, and his biographer Eunapius, he was born at Chalcis (modern Qinnasrin) in Syria. He was the son of a rich and illustrious family, and he is said to have been the descendant of several priest-kings of the Royal family of Emesa. He initially studied under Anatolius of Laodicea, and later went on to study under Porphyry, a pupil of Plotinus, the founder of Neoplatonism. He disagreed with Porphyry over the practice of theurgy; Iamblichus responds to Porphyry's criticisms of theurgy in a book attributed to him, De Mysteriis Aegyptiorum (On the Egyptian Mysteries). Around 304, he returned to Syria to found his own school at Apameia (near Antioch), a city famous for its Neoplatonic philosophers. Here he designed a curriculum for studying Plato and Aristotle, and he wrote commentaries on the two that survive only in fragments. Still, for Iamblichus, Pythagoras was the supreme authority. He is known to have written the Collection of Pythagorean Doctrines, which, in ten books, comprised extracts from several ancient philosophers. Only the first four books, and fragments of the fifth, survive. Scholar's noted that the Exhortation to Philosophy of Iamblichus, was composed in Apamea in the early 4th c. AD. Iamblichus was said to have been a man of great culture and learning. He was also renowned for his charity and self-denial. Many students gathered around him, and he lived with them in genial friendship. According to Fabricius, he died during the reign of Constantine, sometime before 333. Only a fraction of Iamblichus' books have survived. For our knowledge of his system, we are indebted partly to the fragments of writings preserved by Stobaeus and others. The notes of his successors, especially Proclus, as well as his five extant books and the sections of his great work on Pythagorean philosophy also reveal much of Iamblichus' system. Besides these, Proclus seems to have ascribed to him the authorship of the celebrated treatise Theurgia, or On the Egyptian Mysteries. However, the differences between this book and Iamblichus' other works in style and in some points of doctrine have led some to question whether Iamblichus was the actual author. Still, the treatise certainly originated from his school, and in its systematic attempt to give a speculative justification of the polytheistic cult practices of the day, it marks a turning-point in the history of thought where Iamblichus stood. As a speculative theory, Neoplatonism had received its highest development from Plotinus. The modifications introduced by lamblichus were the detailed elaboration of its formal divisions, the more systematic application of the Pythagorean number-symbolism, and, under the influence of Oriental systems, a thoroughly mythical interpretation of what Neoplatonism had formerly regarded as notional. Unlike Plotinus who broke from Platonic tradition and asserted an undescended soul, Iamblichus re-affirmed the soul's embodiment in matter believing matter to be as divine as the rest of the cosmos. It is most likely on this account that lamblichus was venerated. Iamblichus was highly praised by those who followed his thought. By his contemporaries, Iamblichus was accredited with miraculous powers. The Roman emperor Julian, not content with Eunapius' more modest eulogy that he was inferior to Porphyry only in style, regarded Iamblichus as more than second to Plato, and claimed he would give all the gold of Lydia for one epistle of Iamblichus. During the revival of interest in his philosophy in the 15th and 16th centuries, the name of Iamblichus was scarcely mentioned without the epithet "divine" or "most divine". Between the two worlds, at once separating and uniting them, some scholars think there was inserted by lamblichus, as was afterwards by Proclus, a third sphere partaking of the nature of both. But this supposition depends on a merely conjectural emendation of the text. We read, however, that in the intellectual triad he assigned the third rank to the Demiurge. The Demiurge, the Platonic creator-god, is thus identified with the perfected nous, the intellectual triad being increased to a hebdomad. The identification of nous with the Demiurge is a significant moment in the Neoplatonic tradition and its adoption into and development within the Christian tradition. St. Augustine follows Plotinus by identifying nous, which bears the logos, with the creative principle. Whereas the Hellenes call that principle the Demiurge, Augustine identifies the activity and content of that principle as belonging to one of the three aspects of the Divine Trinity—the Son, who is the Word (logos). Iamblichus and Plotinus commonly assert that nous produced nature by mediation of the intellect, so here the intelligible gods are followed by a triad of psychic gods. The first of these "psychic gods" is incommunicable and supramundane, while the other two seem to be mundane, though rational. In the third class, or mundane gods, there is a still greater wealth of divinities, of various local position, function, and rank. Iamblichus wrote of gods, angels, demons and heroes, of twelve heavenly gods whose number is increased to thirty-six or three hundred and sixty, and of seventy-two other gods proceeding from them, of twenty-one chiefs and forty-two nature-gods, besides guardian divinities, of particular individuals and nations. The realm of divinities stretched from the original One down to material nature itself, where soul in fact descended into matter and became "embodied" as human beings. Basically, Iamblichus greatly multiplied the ranks of being and divine entities in the universe, the number at each level relating to various mathematical proportions. The world is thus peopled by a crowd of superhuman beings influencing natural events and possessing and communicating knowledge of the future, and who are all accessible to prayers and offerings. The whole of Iamblichus's complex theory is ruled by a mathematical formalism of triad, hebdomad, etc., while the first principle is identified with the monad, dyad and triad; symbolic meanings being also assigned to the other numbers. The theorems of mathematics, he says, apply absolutely to all things, from things divine to original matter. But though he subjects all things to number, he holds elsewhere that numbers are independent existences, and occupy a middle place between the limited and unlimited. ↑ George Sarton (1936). "The Unity and Diversity of the Mediterranean World", Osiris 2, pp. 406–463 ; Brill's New Pauly, "Iamblichus", 2. 1 2 Shaw, Gregory; Shaw, George (1971-09-01). Theurgy and the Soul: The Neoplatonism of Iamblichus. Penn State Press. ISBN 978-0-271-02322-9. Retrieved 4 June 2010. ↑ Dudley, Charles. Library of the World's Best Literature, Ancient and Modern (1899). ↑ "Introduction to Iamblichus' Exhortation to Philosophy (upcoming talk)". Retrieved 31 May 2015. ↑ O'Meara', Dominic J. Pythagoras Revived: Mathematics and Philosophy in Late Antiquity, Oxford University Press. Iamblichus articles in the Encyclopedia of the Goddess Athena. This article incorporates text from a publication now in the public domain: William Ritchie Sorley (1911). "Iamblichus, the chief representative of Syrian Neoplatonism". In Chisholm, Hugh. Encyclopædia Britannica (11th ed.). Cambridge University Press.